It will now take at least 100,000 signatures to get an official White House response to your crazy idea. I was surprised to learn that the recent petition calling upon the U.S. government to build a Death Star only required 25,000 signatures to get an official response. In terms of supporting crazy ideas on the internet, after all, 25,000 signatures is nothing. It's the equivalent of an official Half-Life 3 Kickstarter with a goal of fifty bucks. It can't miss. But it took the White House a little while to catch on. "When we launched We the People, none of us knew how popular it would be, but it's exceeded our wildest expectations. Through the past year, interest in We the People exploded and we're closing in on 10 million signatures," White House Director of Digital Strategy Macon Phillips wrote. "When we first raised the threshold - from 5,000 to 25,000 - we called it 'a good problem to have.' Turns out that 'good problem' is only getting better, so we're making another adjustment to ensure we're able to continue to give the most popular ideas the time they deserve," he continued. "Starting today, as we move into a second term, petitions must receive 100,000 signatures in 30 days in order to receive an official response from the Obama Administration. This new threshold applies only to petitions created from this point forward and is not retroactively applied to ones that already exist." 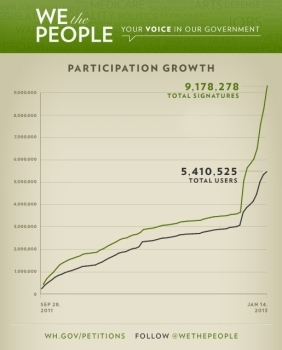 In the last two months of 2012, roughly 73,000 petitions were created, attracting 4.9 million signatures. Among those that have passed the 25,000 signature mark are petitions calling for the Westboro Baptist Church to be recognized as a hate group, a recount of the last election and a repeal of Obamacare. Petitions both for and against a ban on guns, Piers Morgan and Senator Diane Feinstein, and one demanding the minting of a platinum trillion-dollar coin, are also doing well.